Smartphone maker hits back after launch of 10 model and poor display by European MD on the BBC. BlackBerry's EMEA director of comms Oliver Pilgerstorfer has rejected criticism of its relaunch amid the company's ongoing global agency review. Last week's global reveal of the RIM rebrand and long-awaited BlackBerry 10 operating system was marred by a poor performance by European MD Stephen Bates on BBC 5 Live and BBC Breakfast. One insider with knowledge of BlackBerry's comms warned that the company needed to devolve more responsibility from Canada. Speaking to PRWeek, Pilgerstorfer described the global PR review as a 'due diligence process' on a 'global scale' and part of a 'company-wide procurement initiative'. BlackBerry has been reducing costs after being hit by declining smartphone sales, with shipments in the past quarter down 51 per cent year on year. In June last year, CEO Thorsten Heins said the firm was axing 5,000 jobs to make $1bn (£0.6bn) in cost savings. Pilgerstorfer admitted the cuts by Heins had necessitated a 'lean approach' to comms but insisted he was 'well resourced in-house and agency-side to achieve goals'. In the UK, which accounts for 11 per cent of BlackBerry's revenues, the firm is understood to have been working with multiple agencies, though Pilgerstorfer declined to comment on how they were affected by the review. Good Relations has worked as BlackBerry's retained agency for b2b and consumer work in the UK and rest of Europe since April 2011. It was briefed to begin launch activity for the new device and operating system in August last year, focusing on building interest among journalists pre-launch and around last week's event. It is understood the agency has not been alerted to any review of its work with BlackBerry, though the agency declined to comment. Frank PR, also retained for consumer work, has started post-launch media relations and celebrity outreach work and will run the BlackBerry press office. It is understood that social media activity for the launch of BlackBerry 10 was handled by Edelman. The agency declined a request to comment. BlackBerry is the third most popular smartphone hardware brand in the UK behind Apple and Samsung, according to the most recent comScore MobilLens report. It had a 15.2 per cent share of the smartphone handset market as of October 2012, down from 17.7 per cent in October 2011. In the operating system arena, comScore puts it behind Google's Android and Apple's iOS. BlackBerry's market share is down, while Microsoft is nipping at its heels. Nokia began adopting Microsoft's OS for its handsets in early 2011 and announced it had shipped its last device supporting its own Symbian operating system last month. Microsoft's latest version of OS Windows Phone 8 launched at the end of October with handsets from Nokia and HTC. At October's launch, Tutt said while the majority of comms were consumer-focused, business journalists were also incorporated in activity around handset reviews. BlackBerry has not been competing in getting product to market, which has a knock-on effect for comms being under the scrutiny of commentators. 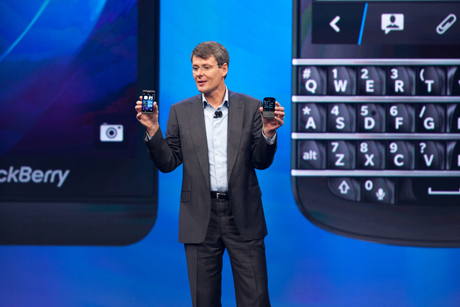 BlackBerry is in an unenviable position and needs to find its personality going forward. The cachet of an association with Alicia Keys is good. The technology world had to wait a long time to see what BlackBerry had to offer. Overall, it made a good start. It is playing a game of catch-up - it will need to quickly demonstrate what the hardware can really do and that it is in this for the long term. Industry view: Was BlackBerry relaunch 'dictated by fear'?